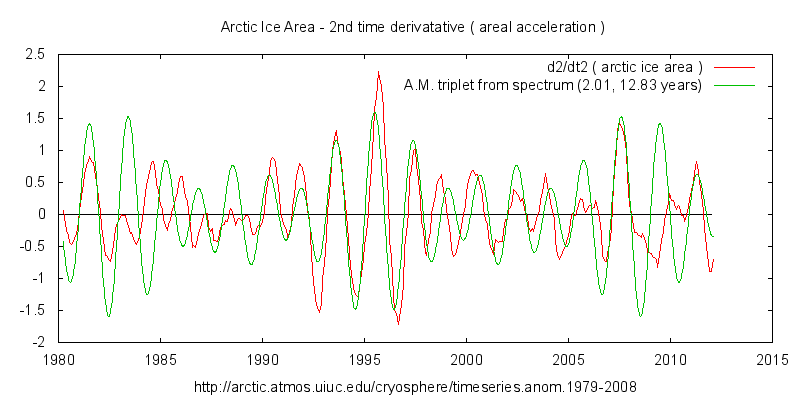 The second time derivative of arctic ice area anomaly (areal acceleration), with annual residual filtered out. Examination of frequency spectrum shows a group of frequency peaks which match the carrier plus side-bands pattern of amplitude modulation. Calculation of the carrier and modulation frequencies that would cause this gives 2.006 and 12.83 years. Reproducing just this triplet shows a similar variation to the data including the dramatic acceleration of ice melting during 2007.